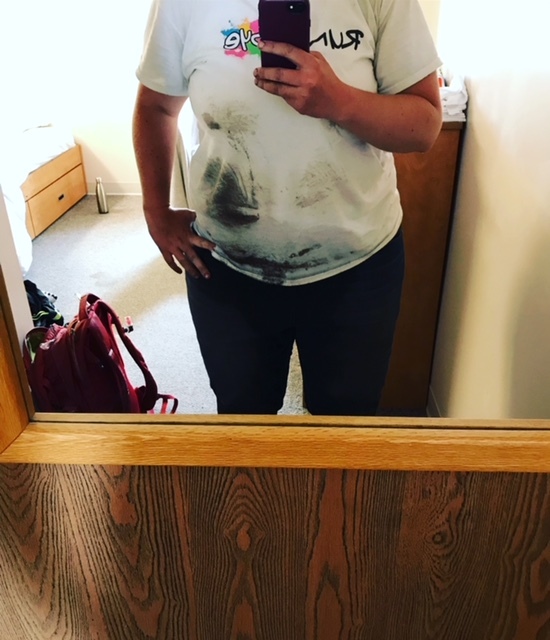 One of my recent stories was about some unintentional “swamp-wading” I did when I was taking the Ontario Wetland Evaluation System course in North Bay, Ontario. If you recall, we were venturing out to a fen, but first we had to cross the swamp that surrounded it. Neck-deep in muck, soaked from head to toe, we made it…just barely. A couple of days later, we ventured out to another fen, this one called Frair Lake. This fen was a little different though. As was becoming routine, all of the course participants piled onto a big, yellow school bus. The bus chugged along for a good half hour along winding country roads and finally turned onto a dirt road that led to a quarry. We all filed off the bus and then headed down the road, passing the quarry entrance and leaving it behind to the left. We hiked down a wooded path off the dirt road, passed through some dense forest and then there it was – the stunning, dark blue water of Frair Lake. It was 30 degrees C that day and the sparkling ripples of Frair Lake called our names, trying to lure us in for a refreshing splash…but we had to resist. We had lots of important field work to do and only about 7 hours to do it! Working in groups of 4, our task was to conduct a field visit of the wetlands surrounding Frair Lake, and prepare our own wetland evaluation for the site. I won’t get into all the details of what a wetland evaluation involves, but it broadly covers characteristics of the wetland including size and condition, the types of wetlands present (i.e. bogs, fens, swamps or marshes), hydrological components (i.e. flood attenuation, water quality, etc. ), biological components (i.e. wetland productivity, soil type, etc. ), social components (i.e. presence of wild rice, furbearers, etc.) and various special feature components (i.e. presence of species-at-risk, winter cover for wildlife, etc.). Eager to get the day started, we set off on our journey around the lake. At first there was some swampy habitat with lots of towering black spruce trees, but because of the high temperatures and lack of rain, the ground was relatively dry, so this was an easy hike around. We quickly collected data on the vegetation forms and communities present, took some soil core samples to determine the different soil types and continued on with our day. “This is sooooo much easier than navigating that swamp,” I thought quietly to myself. But then we reached a transition point in the wetland, where the tree cover disappeared and we were left with what appeared to be very mossy and low vegetation. As we stepped onto this we noticed that the ground was certainly not stable. We had just arrived at what are lovingly referred to as the Frair Lake floating mats. These floating mats were actually considered fens, another type of wetland. True fens are not really common in southern Ontario, and I had never experienced fens until this course. Fens are peatlands, which simply means they are peat-covered lands. They have little tree cover, are dominated by mosses and sedges and have a higher pH than bogs. 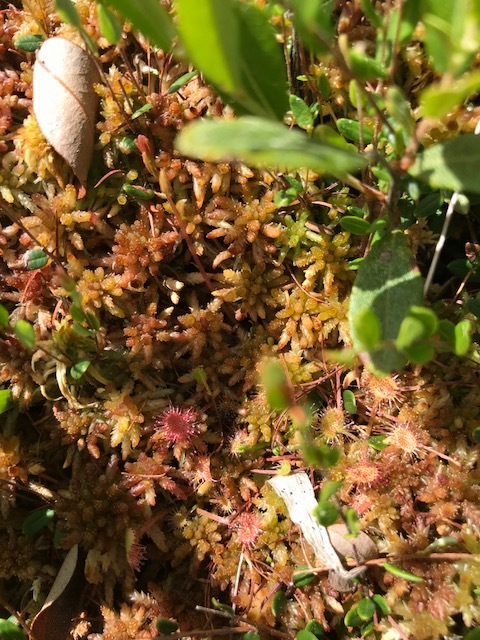 In fens, floating mats of Sphagnum moss often extend out into the water, with poorly decomposed peat at the top, and more well-decomposed peat towards the bottom, giving them a squishy and sinking feeling under your feet. Stepping out onto the fen, I took a few small and nervous steps. Despite being soft under my feet, it was actually quite easy to navigate and kind of felt like walking on a cloud. But we quickly learned though that the stability of this floating mat was not consistent throughout. We first noticed this when a member of another group was walking towards us and, well, the next second he wasn’t. One of his legs had pushed through the floating mat and into the water of Frair Lake below. We helped pull him out and he was just fine, despite a very wet leg. I had a few close calls throughout the morning myself, losing my footing or almost sinking deep enough to break through the peat. We continued around the lake on the floating mats, identifying lots of unique fen species, searching for species at risk and admiring the beauty of this spot. Another photo of Frair Lake – You can see my group member Bill standing on the floating mat. 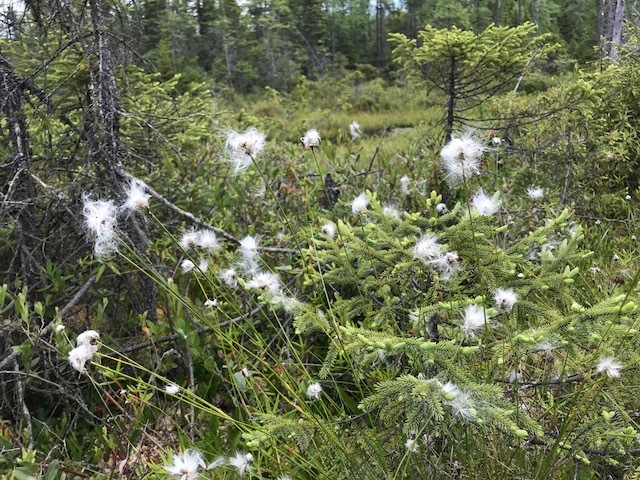 As the day came to a close, we finished the loop around the lake with wet feet, covered in sweat and a good number of deer fly bites, carrying notebooks filled with data and having acquired a very deep appreciation for the beautiful wetlands of northern Ontario. I have spent a lot of my time in the wetlands of southern and eastern Ontario, but there is something so different about the wetlands of the north. It might just be the fact that they are much bigger and much more pristine than their southern counterparts, or that many of the wetland types in the north are different from those in the south. It all felt so new and exciting to me. Whatever it was, it has me longing to go back and experience even more. I had a wonderful summer of fieldwork…my mind is full, my heart is huge and my eyes are tired. I think that’s what all field biologists strive for at the end of a summer field season. I still have a significant amount of fall fieldwork to do, but I wanted to take a few moments to reflect on my summer in the field. I learned SO much this summer… SO SO SO much! I learned new plant species I had never seen or heard of before. I started noticing more of nature including butterflies, dragonflies, birds, reptiles and amphibians. I noticed the arrangement of holes and cavities in trees. I noticed the behaviours of birds during mating season and the incredible defense of nests during nesting season. I started learning spider species (surprising given this), recording calls of birds to look them up later and taking photos of tracks in the mud. My mind is still overloaded from everything, I noticed and learned this summer, and I hope every field season from here on out is the same. 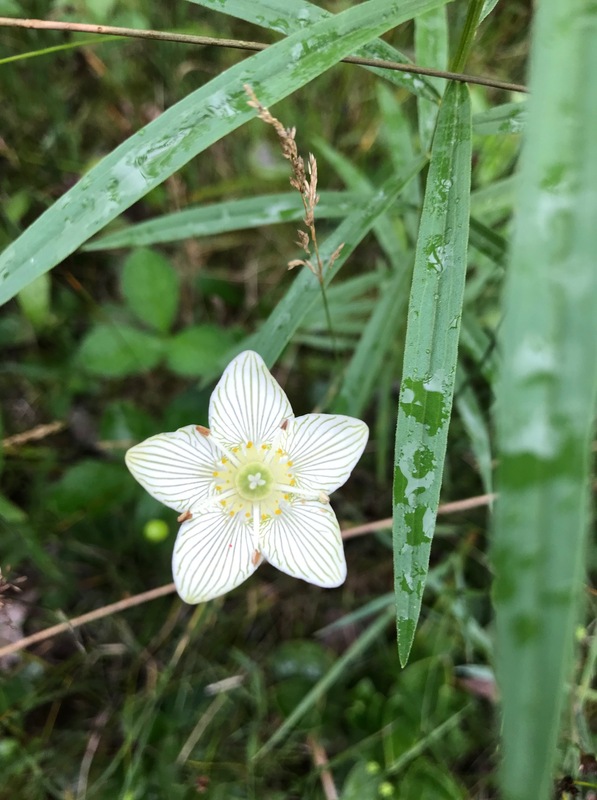 Grass of parnassus – new species for me! I love field work. I love being outside. I love nature and everything about it. My heart was in the Frontenac Arch for most of the past decade, and now my heart is stretched across so many new places I have grown to love: the scrubby wonders of the Napanee Plain, the always adventurous Prince Edward County, the quiet beauty of the Kawarthas, the wavy coast of eastern Lake Ontario and the rolling hills of Northhumberland County. Next summer will come quickly, and it will bring many more new places to fall in love with, I’m sure. Fieldwork can be tough. Most of your time is spent hiking to specific points, carrying lots of equipment, and in weather or conditions that aren’t ideal. For instance, this summer, I did a lot of “bushwhacking” which according to the Merriam-Webster dictionary is “to clear a path through thick woods especially by chopping down bushes and low branches”. My definition is a little different. My definition of bushwhacking is “to get from point A to point B through thick vegetation, which often has thorns, prickles, and other irritants present, while trying to disturb the natural environment as little as possible and leave some sort of remnant path to find your way back”. A little wordier perhaps, but all very true and relevant to my summer in the field. Thick red cedar on alvars, cattails twice as tall as me, and prickly ash pricklier than ten prickly things were common settings to be “bushwhacking” through. But the reward is always worth the hardship in the end. 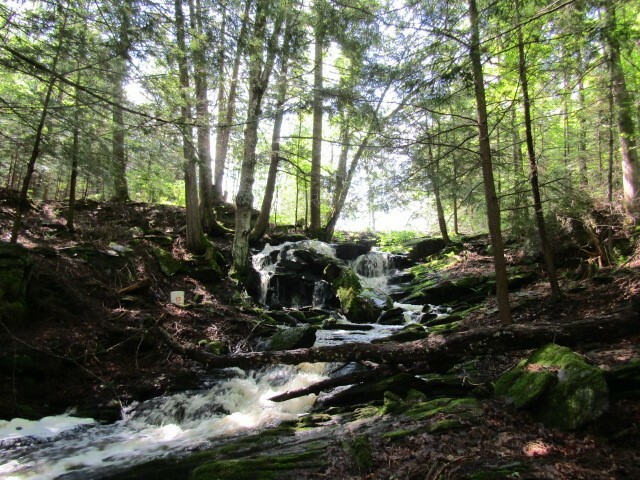 Check out a couple of the epic places we found as a result of some serious bushwhacking. So as I wrap up the summer field season, and start the cooler, wetter, wilder fall field season, I sit here smiling with my full mind, huge heart and tired eyes and I think about all the possibilities the next summer field season will bring. Please join us in welcoming Cheryl Reyes to the blog this week! 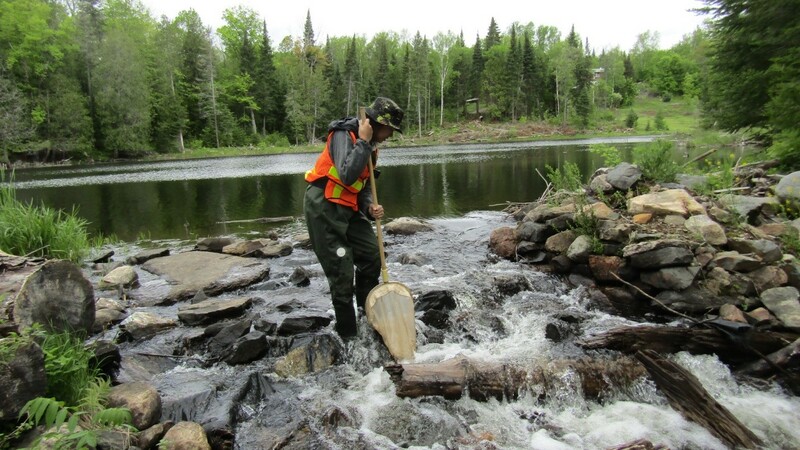 Cheryl, a recent graduate from the University of Waterloo, is currently working as a Conservation Technician with the Nature Conservancy of Canada. For more about Cheryl, see the end of this post. Although I have been working at a land conservancy monitoring alvar and tallgrass prairie ecosystems, and managing invasive plant species for the last few months, one thing remains the same: when I stumble upon a river, wetland or small creek I always wonder, “what kind of benthic invertebrates are living there”. This recurring thought stems from my first true interest in the field of ecology: water and benthic macro-invertebrate sampling. Sampling benthics often means going to very beautiful places sometimes in the middle of nowhere. Benthic macro-invertebrates are aquatic insects that live at the bottom of water bodies, such as aquatic worms, leeches, beetles and flies. They do not have a backbone and are large enough to see with the naked eye, but when you put them under a microscope for further analysis they look much more impressive! These little creatures can reveal a lot about the health of a freshwater system because they are an important part of the aquatic food chain and respond quickly to stressors such as pollution. For this reason, they are referred to as “indicator species”. One of my favourite photos of a mayfly larva, from the Ephemeridae family. 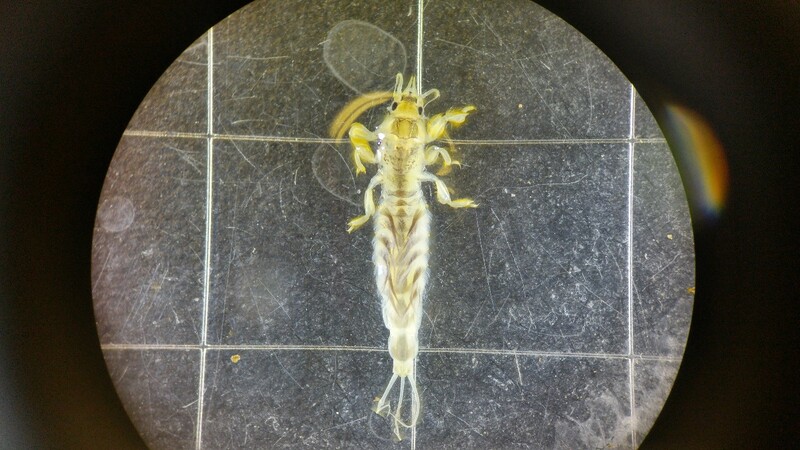 You can distinguish mayfly larvae by their side gills and three (sometimes two) tails. This one has tusks on its head! I was first got introduced to benthics during a field ecology course at the University of Waterloo. 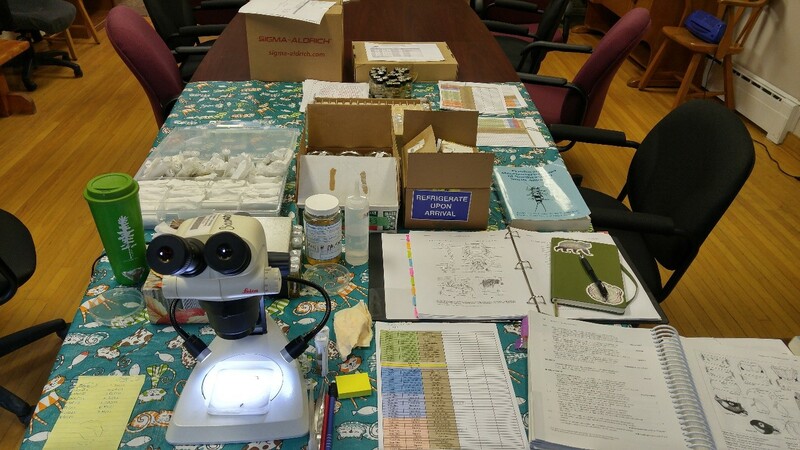 Since then I have collected and identified benthic invertebrates for many organizations, most recently during my role as a Monitoring Technician at the Crowe Valley Conservation Authority. Crowe Valley runs a benthic monitoring program within their watershed to monitor water quality. 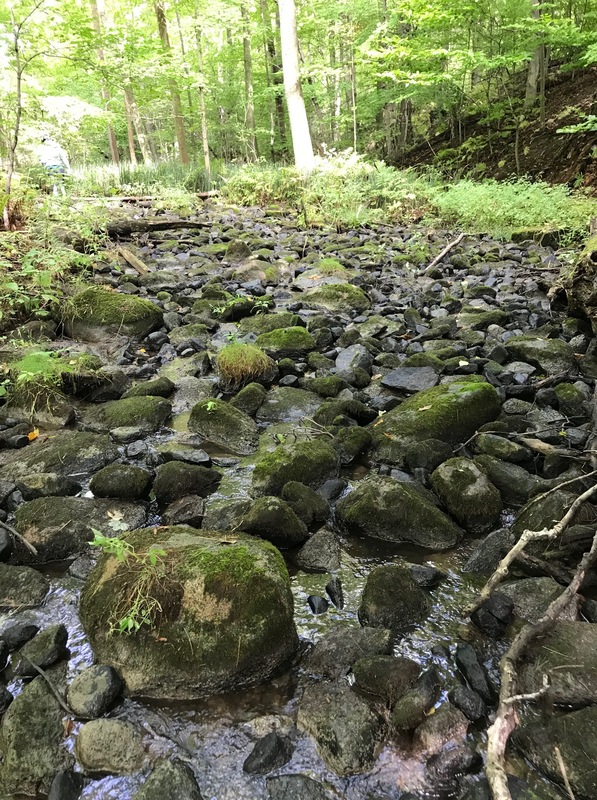 Sampling sites are located throughout the watershed and benthics sampling follows the Ontario Stream Assessment Protocol (OSAP) and the Ontario Benthos Biomonitoring Network (OBBN). Sampling for benthics is fun and easy to do. Dressed in waders, with a net in hand, two people get into a stream and move between the banks while kicking up the substrate on the bottom. The net is swept back and forth through the water to collect benthics. The continuous sweeping motion is important to prevent any benthics collected from swimming out of the net. After three minutes of kicking and sweeping, the contents of the net are emptied into a bucket and hauled back to the lab/office for identification. Me sampling for benthics. This was a great day because it was the only day of the entire field season I didn’t have to cover my face to protect myself from the bugs. However, as is the case with most field work, sampling for benthics is not always the most glamorous job. Sometimes you get so into the Footloose-esque substrate kicking that you forget to watch your footing and trip over some large rocks, a log, or if you’re lucky (or unlucky) a large snapping turtle. Other times you wish the three minutes of kicking would be over because you can feel the sweat pooling in your waders. Much of the time you can’t see a darn thing because you have your bug jacket on to prevent all the mosquitos, black flies and deer flies from devouring your flesh. And when you look at the contents of your net, it’s hard not to wonder, “Are there actually any bugs in this giant pile of mud, rocks and leaf litter??”. But the most draining thing is hauling your large buckets and equipment to the site, then hiking the full buckets out from isolated locations after a long day’s work…then enduring the frequently lengthy drive back to home base. My work station for 8 months at the Crowe Valley office. During my undergraduate, I was used to identifying bugs in a laboratory setting. But while working at Crowe Valley, I had to use ingenuity to set up a functional work station! Studying benthics is definitely its own realm of ecology, with its own fieldwork quirks, and I love it. Why? The reward is always great. When you find benthics in your bucket and put them under a microscope, you get a sense of how complex aquatic ecosystems really are. I could spent hours looking at all the different taxa and the features that make them truly unique specimens. And because they tell you about water quality, studying them allows you to begin to appreciate how important water is in our everyday lives, and why it’s essential that our ever-developing society conserves and protects freshwater ecosystems. So next time you see a body of water, remember that there is a little universe lurking in the depths of the substrate. All you need to discover it is some waterproof footwear, a container and a net. 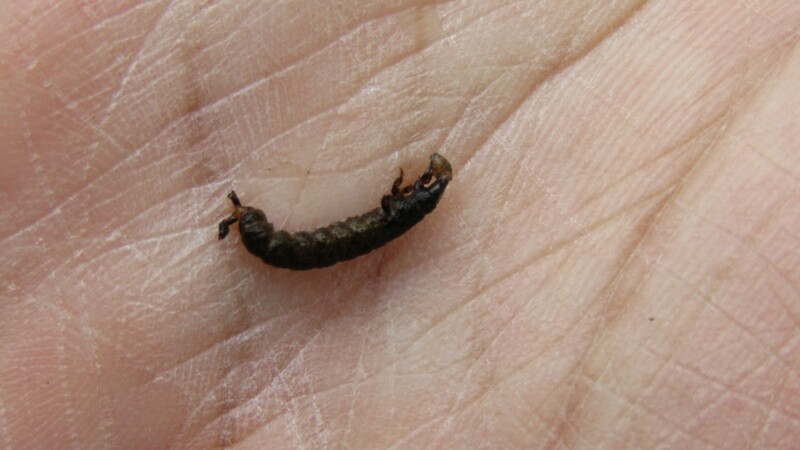 Caddisfly larva from the Hydropsychidae family in the palm of my hand. This taxa, as a member of the Hydropsychidae family, spins nets that help it catch food such as algae, leaf litter and smaller benthic invertebrates. Cheryl Reyes is a graduate of the School of Environment, Resources and Sustainability at the University of Waterloo. 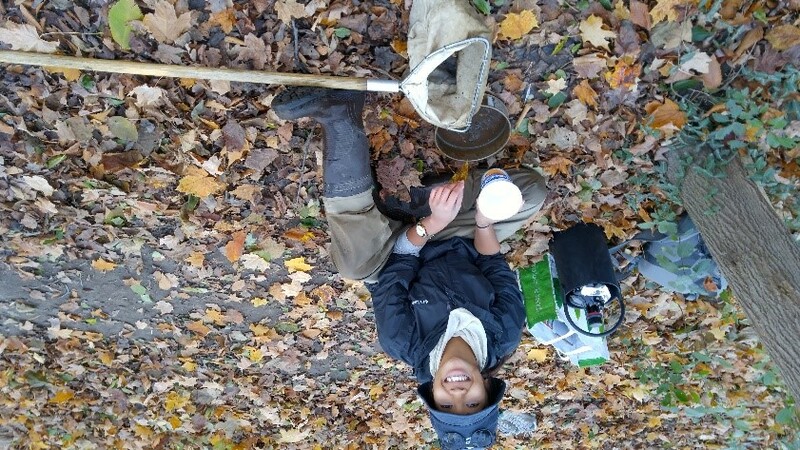 Her undergraduate research focused on assessing the benthic invertebrate communities of restored streams in urban areas. She is currently working as a Conservation Technician for the Nature Conservancy of Canada. Fieldwork has always been comfortable for me. And by comfortable, I don’t mean physically comfortable. I can’t say the days I spent hunched over in the 40 degree sun with deer flies nipping at my elbows were by any means “comfortable”. By comfortable, I mean mentally comfortable, or familiar. I’ve spent most of my time in old fields and meadows and these habitats quickly became very familiar to me. They were filled with familiar sights, sounds and surroundings. I dabbled into shrublands, forests and even some riparian areas but the majority of my time was spent in one general habitat type. I knew when I started working as a Conservation Biologist though, that I would have to move out of my comfort zone. 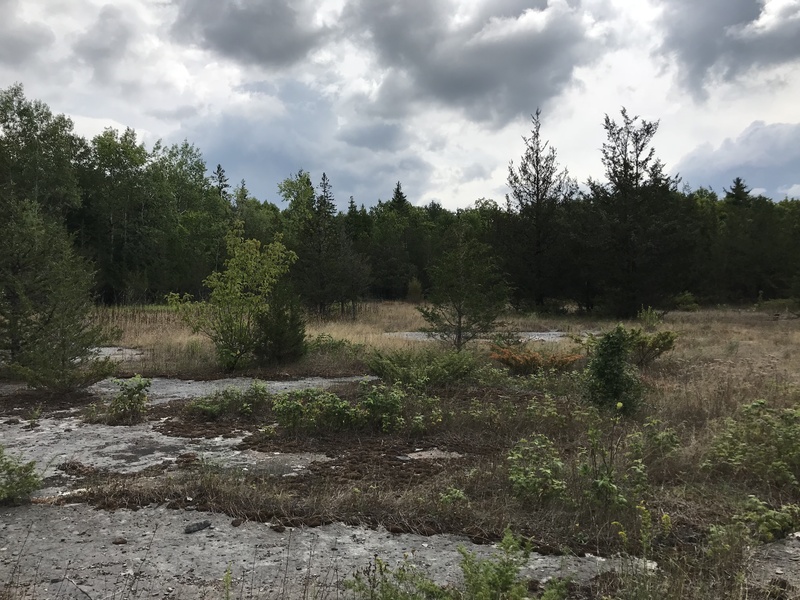 I would be managing properties with massive forest and wetland complexes, alvar grasslands, woodlands and even some beautiful Lake Ontario shoreline. I was going to have species at risk (that weren’t plants…Imagine that!!!) to consider, and multi-species recovery strategies were going to become my new bed time reading material. One of the things I wanted to do to prepare for this was to brush up on some wetland ecology, biology, physiography, etc. So, I decided to take some time off work and take the Ontario Wetland Evaluation Course. I really had no idea what I was getting myself into. I knew it was described as an “intensive” course with significant course and field components…how intense could it be? I arrived in North Bay on the Sunday evening and by Monday at lunch we were out in the field, at the beautiful Cache Bay Wetland, doing things like delineating wetland boundaries, examining soil cores and tallying wetland plant and bird species. It was an exhausting day, but I learned so much and was really excited for the all-day field trip the next day. The following morning, we packed up in preparation for Highview Fen. I was really excited because southern Ontario doesn’t have that many true fens, at least compared to northern Ontario. As we packed up, one of the instructors warned us that this was by far the most intensive field day we would have. Rainboots would be useless, you’ll either lose them or get stuck. Wear shoes you really don’t care about and be prepared to get “very wet”. It was that comment that tweaked my anxiety level a little bit. We arrived at the site, which was…a golf course?? The bus drove away and we hiked along the edges of the course, checking out the irrigation ponds and standing lifeless every time someone putted. Why was this so bad? Then we started into the swamps. At the beginning, it wasn’t that challenging…you sank down to your calves into mud and water, but it wasn’t that physically demanding. After taking a break and sitting on some peat hummocks to eat lunch, we had to cross a “moat”. I was picturing a castle, with blue flowing water surrounding it, and as you can imagine, that wasn’t the case. It was a swamp where the water and mud went up, past your elbows in some places. I remember taking the first step into it, where the ground quickly dropped off into the water. My hands grasped the trees around me as I tried to stay as high up as I could. I remember pausing for a moment and then announcing “This is SO OUT OF MY COMFORT ZONE”. And I wasn’t the only one. I was met with a “ME TOO!! !” from the guy behind me. After fighting through the deep swamp for 10 minutes, we pulled ourselves out of the moat and into the fen. It was totally worth it. 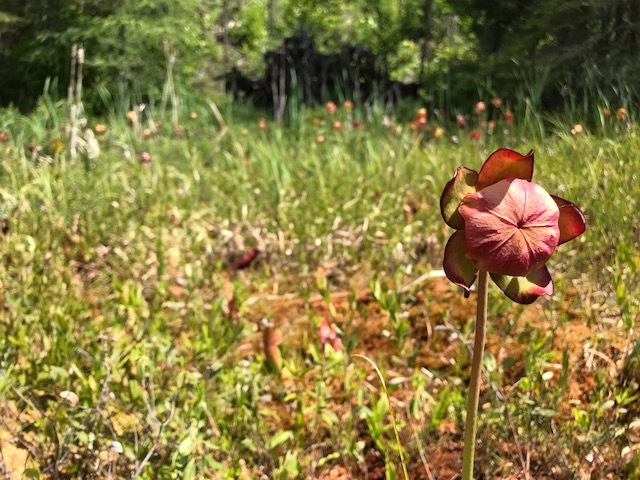 Species like cotton grass, sundews, and pitcher plants littered the ground. I had never seen anything like it. So beautiful and untouched. I knew we were running short on time and had to cross the other side of the moat to get out, but I didn’t care. I took a moment to enjoy this incredible place and think about just how lucky I was to be there. This course made me realize that if I stayed where I felt comfortable and I spent the rest of my life in old fields, I would never have gotten to see this incredible place. Keep in mind this was only the second day of the course, and for the next 3 days I continued to push the boundaries of familiarity and experienced some of the most amazing things. To be continued…. My post swamp dirtiness doesn’t do it justice! If only a camera captured wetness.